Explained: How to make money by making videos? 22nd February, 2009. A remarkable day for India. Three Indians won the prestigious Academy Award for their contribution in Danny Boyle’s Slumdog Millionaire. A.R. Rahman won for the Best Original Score, Gulzar for Best Original Song & Resul Pookutty for Best Sound Mixing. The film won a total of 8 Academy Awards. It also won seven BAFTA awards. The film was adapted from Vikas Swarup’s novel Q & A by screenwriter Simon Beaufoy. Beaufoy made three trips to India for researching for the script. He interviewed numerous street children to understand their lifestyle and attitude. Producers approached Danny Boyle to direct the film but Boyle was at first skeptical about making a film about a game show. But, he decided to read the script once because he loved Beaufoy’s work in The Full Monty (1997). He was impressed by the multiple storylines and decided to direct the film. The film was shot entirely in India, mostly in real Mumbai Slums in parts of Juhu. Danny Boyle was highly inspired by Ram Gopal Verma’s Satya (1998) & Company (2002) which helped him a lot to make the slum scenes more realistic. For the casting, five Indian casting directors were hired to look for actors which looked convincing as slum dwellers and also can speak English dialogues. Casting directors couldn’t find such actors. So they found real slum children. Boyle placed the payment of the three child actors in a trust which they can get once they complete their grade school. Loveleen Tandan, one of the casting directors, suggested that some of the dialogues in the film need to be in Hindi for the film to be more realistic. Boyle agreed and nearly 20% of the dialogues were in Hindi. Loveleen wrote the Hindi dialogues. Bollywood Superstar Shah Rukh Khan was first offered the role of Prem Kumar, the host, but he declined the offer because he thought it depicted the show which he once hosted in a bad light. Later Anil Kapoor played the role. Boyle has cited Amitabh Bachchan’s Deewar(1975) as one of the important films of Bollywood. The chase sequence in the opening was based on a chase sequence in Anurag Kashyap’s Black Friday (2004). Boyle drew various styles from Bollywood Commercial Films. One of them was the montage sequence where the two brothers jump off a train and suddenly is seven years older. This style is a trademark of Bollywood films of the 70s. Shooting in heavily crowded Mumbai Slums was a big challenge. It was nearly impossible to shoot with 35mm film cameras with big setup. Boyle and Cinematographer Anthony Dod Mantle decided to use a low key setup for the slum scene which wouldn’t draw much attention from the passerby. They decided to use Silicon Imaging’s SI-2K Digital Camera which was smaller in size and portable. Uncompressed raw footage from the camera was recorded in nearby laptop at 2K quality. The heat and humidity of Mumbai was dangerous for the equipments. The laptops were packed with 20-22 kg of dry ice for cooling. Though the slum scenes were shot in Digital, majority of the other scenes were shot in film. Some scenes were shot simultaneously with multiple film cameras and digital cameras. It used five different kind of film stocks and merged them craftily to give the film a distinctive look. Anthony Dod Mantle won the Oscar for Best Cinematography. This was the film to be shot in Digital which won an Oscar. This was a huge win for Digital filmmaking. 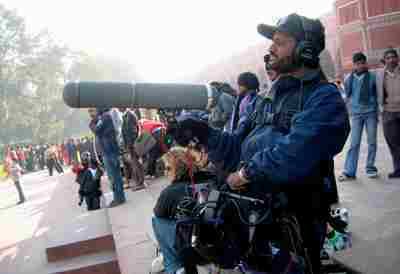 Recording sound on the noisy locations of Mumbai was a big challenge for Sound Recordist Resul Pookutty. The challenge was even harder when scenes were filmed with multiple cameras simultaneously. The boom mic had to be kept out of the frame. Pookutty used 10 crew members for Sound Recording. The first challenge for Sound Editor and Designer Glenn Freemantle was to remove the noise from the on-location recording. Since most of the scenes were shot in crowded places, there was great amount of noise that needed to be removed. Next, the sound team had to record sounds of Mumbai slums and other ambient sounds to design the complete soundscape of the film. The music of the film was composed by arguably the most famous Indian Composer A.R. Rahman. Rahman completed the score in 20 days. Boyle chose Rahman to do the music because he wanted the eclectic fusion of Indian Classical music and R & B. Rahman’s score was acclaimed worldwide and has got all major awards including Oscar & Grammy. Rahman became the first Asian to win 2 Oscars in the same year. “Jai Ho” got the Oscar of Best Original Song. The song was used as a Bollywood style Song and Dance number in the end of the film choreographed by Longiness Fernandes. The song was composed by Rahman for Subhash Ghai’s film Yuvvraj (2008) but Ghai rejected the song. More in How'd they shoot this?